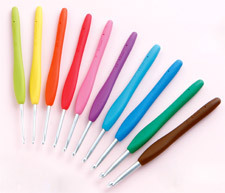 Now that you know which supplies are needed to do an amigurumi, I’m going to teach you how to hold your crochet hook and yarn. Well, the first thing I have to say it is that it doesn’t exist a right way to hold a crochet hook. You can hold it anyway you want, the important it is to find a position which makes you feel comfortable. I know that it is hard to feel comfortable in the beggining and, probabilly, you will feel a little lost in which way to hold your hook, so, don’t be distressed, it is completely normal to have some difficult at this stage. 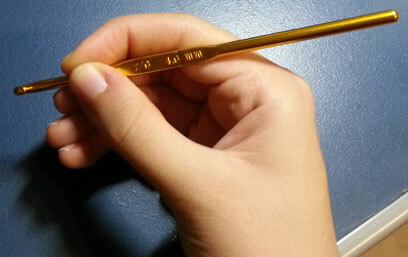 Thus, I will show you here the most common ways to hold a crochet hook. You should have a try in each one and see which one makes you feel more comfortable. However, if you didn’t like any of this methods, you can search on the web for another way or try to hold the hook in your own way. However, please, always remember, it is very important to feel comfortable, so you will be able to crochet for a long time without any pain and avoid repetitive stress injury. Also, another important thing, that my dear grandma teached me, it is that your hook should be everytime slighted turned toward to you, which makes easy to pull the yarn through the loops, as you will see in the photos below. This method works the same way as holding a pencil to write. This method is similar to holding a knife. So, now that you have an idea of how to hold your crochet hook, we are going to talk about your other hand, the one which will hold the yarn and it is very important to control the yarn tension, helping you to achieve the accurate gauge of the pattern. I think this hand is harder to get used to, because it is very difficult (well, it was for me) to control the yarn tension in the beggining, but, always remember that crocheting is practice! So, a little practice and you will get used to it. Tip: always leave some yarn unwound from the yarn ball, because it is very uncomfortable to pull the yarn, while it still in the ball of yarn and, besides, it will makes difficult to control the tension. In this method you will use your little finger to control the yarn tension. 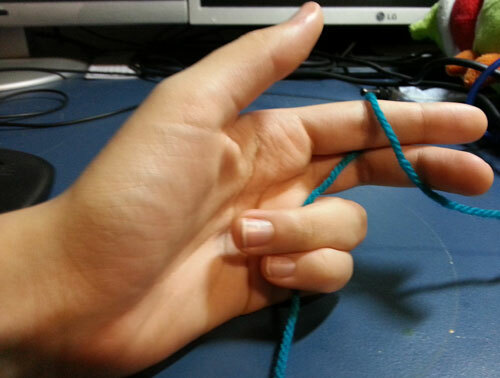 Thus, you will wrap the yarn over your pinky, like on the photo. 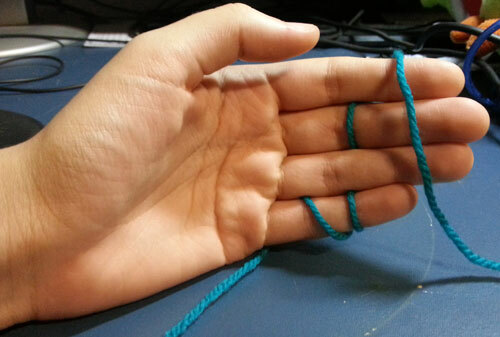 In this method you will use your index finger to control the yarn tension. For that, you will wrap the yarn over your index finger and, also, you will use your pinky and ring finger to hold the yarn between your fingers and palm. Also, it is very important to hold the yarn in a comfortable way, avoiding too much muscular effort in order to prevent repetitive stress injury. A very common repetitive stress injury in crocheters is the carpal tunnel syndrome, which happens when the median nerve is compressed at the wrist. 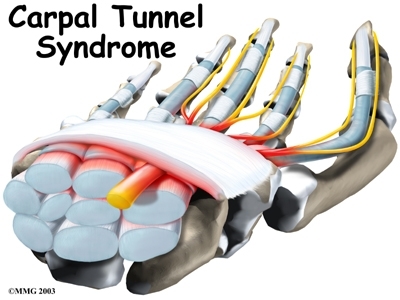 The carpal tunnel is a narrow passageway in the wrist composed by bones, a ligament and nine tendons, which are connected to the bones and muscles of the hand. Under repetitive stress these tendons may swell compressing the median nerve, which pass throught the tunel, resulting in the carpal tunnel syndrome. The most common syptoms are numbness and “pins and needle” sensation, specially when doing activities that involves the wrist. 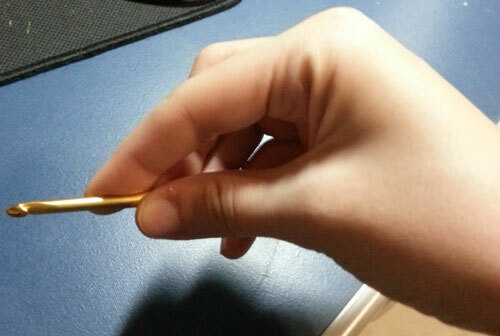 As it gets worse, it makes difficult to use the hand, because the hand loses grip strength. So, to help preventing injuries two things are essencial. The first one it is to rest! Your body it isn’t a machine, it needs to rest. So, please, don’t take long crochet sessions, try to have some breaks. Your body will thank you for that :) The second thing it is stretch. Stretching removes tension and increases blood flow, which will make you feel better. You should stretch all the muscles in the area of concern, which means the muscles of your hand, arms, until your spine. Stretch 6-8 times a day. That’s it! See you on the next tutorial^^ Please, remember, crocheting may be addictive, but even crochet may be bad to you in excess! Avoid repetitive stress injury. i recently got the clover amour hooks and i love them! That’s great! They really are very comfortable. I’ve got one in G size for me and also love it!